The NNPC/SNEPCo National University Scholarship Programme 2017 application is currently ongoing. Details of the NNPC/SNEPCo scholarships application and closing date for submission have also been released by the providers of the scholarship. 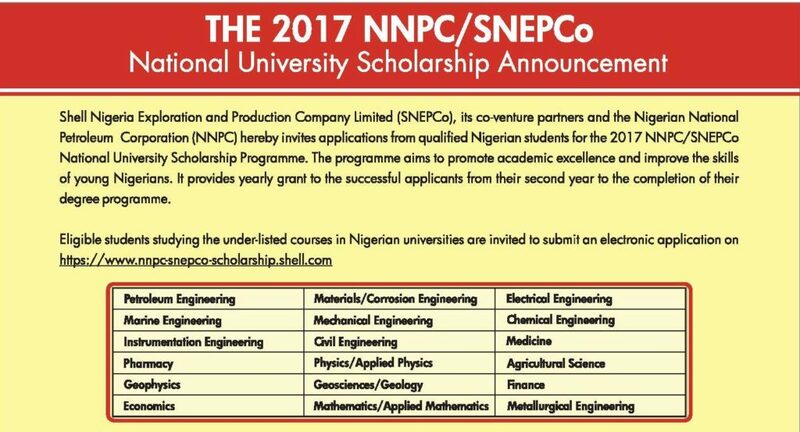 Shell Nigeria Exploration and Production Company Limited (SNEPCo), its co-venture partners and the Nigerian National Petroleum Corporation (NNPC) hereby invites applications from qualified Nigerian students for the 2017 NNPC/SNEPCo National University Scholarship Programme. Interested and qualified candidates who wish to apply for the scholarship awards for 2017 should click here to apply online. Letter of Identification from State of origin indicating applicant’s local government of origin. All applications for the NNPC/SNEPCo 2017 National University Scholarship must be submitted not later then 30th September, 2017. Beware of fraudulent websites when applying for the NNPC/SNEPCo scholarship online. Such websites may ask you to make some payments during the application process. NNPC/SNEPCo scholarship application is FREE. SNEPCo DOES NOT ASSIGN ‘Representatives’/’Agents’ to assist applicants’ process applications. Only short listed candidates will be invited for a computer based tests in selected centers nationwide.